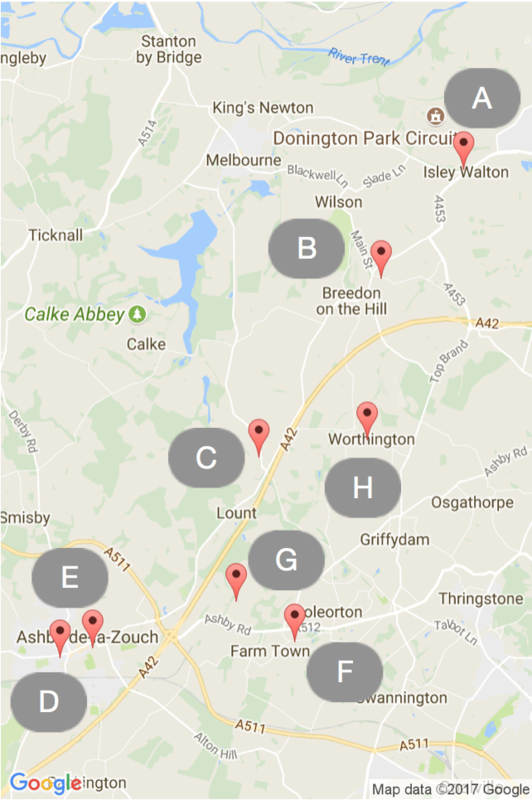 We are a group of seven Church of England churches, serving the communities of Ashby de la Zouch, Lount, Staunton Harold, Worthington, Coleorton, Breedon on the Hill, Tonge, Wilson and Isley Walton. We are here to proclaim the good news of Jesus Christ through what we say, what we do and who we are. We believe that following Jesus brings hope and purpose for us and for the nations of the world. We would love to share our hope with you! You're probably wondering why we have called ourselves the 'Flagstaff Family of Churches'. Some of you will know that the roundabout near Ashby, linking the A42, the A511 and the A512 is called the Flagstaff Roundabout. It was this that inspired one of our church members to suggest that we be called the Flagstaff Family. She pointed out that from this roundabout, roads lead to each of the communities ur group of churches serves. Whilst it's not the geographical centre of our group, it is, then, a hub that links us together. Since choosing this name, we have uncovered other local associations with the name 'Flagstaff'. John Blunt of Staunton Harold has told us that at Ashby's old shooting range (on what is now Range Road - what else?) there used to be a flagstaff. When his father acquired a farm in Coleorton John remembered this flagstaff and suggested that the farm be named after it. Then, later, when the coal board was looking to name a coal seam underneath Coleorton, they picked up this same name, and called it the Flagstaff coalface. Cultural associations abound too. For example, when the Queen is in residence at Buckingham Palace, a flag flies to show this. We believe that God is living and active in our communities. The flag of our logo, flying on the flagstaff, reminds us that God is here; that he is 'in residence' amongst us. Flagstaff has resonances in the Bible, too. In the Old Testament, there is a beautiful picture of God flying a flag over his people. It is the nature of this flag that is so moving: 'his banner over me is love' we read (Song of Songs 2.4). We hope you will be reminded, each time you receive a Flagstaff Flyer or remember the name, that God's banner over you is love. When someone we love dies, we remember them every single day. Little things will bring them to mind and we will remember and smile, or remember and shed a tear. Particular times of year will be especially poignant: birthdays, anniversaries, Valentine's Day, Mothering Sunday, Christmas - each of these will provoke remembrance with a special intensity. In the rhythm of the church's year, we set aside the first Sunday in November to remember our loved ones who have died. We do this at quiet, reflective services, where those who have died are remembered through music, readings and candlelight. Often the names of those who have died are read out as a way of marking their importance to God, and to us. We hope you will feel welcome at one of these services if you feel this is something you would find helpful. Come and gather with others who have been bereaved. Come and gather in the presence of God who promises to be close to the broken-hearted. Ashby foodbank is a church lead community project. Having given out 17,000 meals last year, the Ashby foodbank is grateful for all donations of no perishable food and toiletries. You can lead donations in Holy Trinity, or St Helen’s, during the day. Ashby foodbank is part of the Trussell trust and benefits people of any faith or none.